Despite being relatively new on the market, InterTrader has rapidly established itself as a one of the biggest players in this category due to their sophisticated market information, in-depth educational materials, slick trading platform, low spreads and some excellent offers. InterTrader costs are especially low because instead of commission they simply offer users very low spreads. Spreads are basically the difference between how much a broker offers to buy and sell for;. This can be compared to bookies offering odds either side of a bet that don´t add up exactly. When it comes to InterTrader this is an apt comparison as the company was formed through a merger between the London Capital Group and Party Gaming, one of the biggest online gambling companies. InterTrader offer some excellent educational tools which will not only teach you how to practically use their platform but also take you through the ins and outs of spread betting, CFDs and forex trading. What is more, upon signing up to their free Practice account you will also have access to their webinars which consist of 4 hours of structured tutorials. These complement the demo account perfectly and ensure that you do not begin trading completely wet behind the ears and consequently lose money in the learning process. Once you have signed up with InterTrade you will have access to their live webinars which give an excellent personal touch to their educational materials. 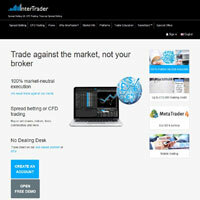 We were especially impressed with the offers available with InterTrader. Firstly, there is their welcome offer of a bonus of up to £5000 upon sign-up. New users' initial deposits of over £500 are topped up by an additional 10% (up to a maximum of £10,000) providing you make opening trades with a total stake of double or more than the bonus amount. (This offer excludes equity trading and is for new clients only. See the merchant's site for more details). Once you have taken advantage of this initial offer you can enjoy InterTrade's Trade Back scheme which reimburses your account with a percentage of what you have spent on spreads depending on your loyalty. Those within the Silver loyalty tear must be spending between £500 and £1999 on monthly spread fees to qualify for a rebate of 5%, Gold users spending between £2000 and £4999 enjoy a 7.5% rebate and Platinum users spending more than £5000 qualify for the full Trade Back offer of 10%. This basically means that InterTrade´s already low spreads are further tightened as long as you maintain a high trading volume. However it must be kept in mind that users will have to be trading relatively high amounts to even enjoy Silver Loyalty Trade Back rates; even monthly spread fees of £500 will require you to be trading a very high monthly volume. Finally, as a (hypothetically) satisfied customer of Intertrade you can recommend friends to sign up for which both parties will be awarded £100. InterTrade offers a wide range of investment opportunities including individual shares, commodities, bonds, futures, stock indices and currencies. As with the complex information and market analysis tools available, beginner traders will more than likely not require such an extensive range of investment opportunities while for advanced traders, the more the better! With all of these products, spreads are variable but kept as low as possible and are always highly competitive when compared to market rates. Customer services at InterTrade are, despite being only available during office hours, helpful and courteous and there is a 24 hour dealing desk available for you to make trades when you don´t have access to a computer. Overall, InterTrader is an excellent platform offering fantastic educational resources, market information, trading opportunities and special offers. We would fully recommend that traders who are committed, whether experienced or new, consider InterTrader. Even if you just check out their practice account and free webinars you will certainly learn something.